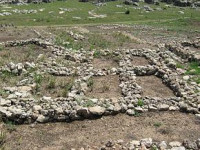 Çayönü is a Neolithic settlement in southeastern Turkey inhabited around 7200 to 6600 BC. It is located forty kilometres north-west of Diyarbakır, at the foot of the Taurus mountains. It lies near the Boğazçay, a tributary of the upper Tigris River and the Bestakot, an intermittent stream.